You are here: Home / All blog posts / Failure, failure, failure….success!! 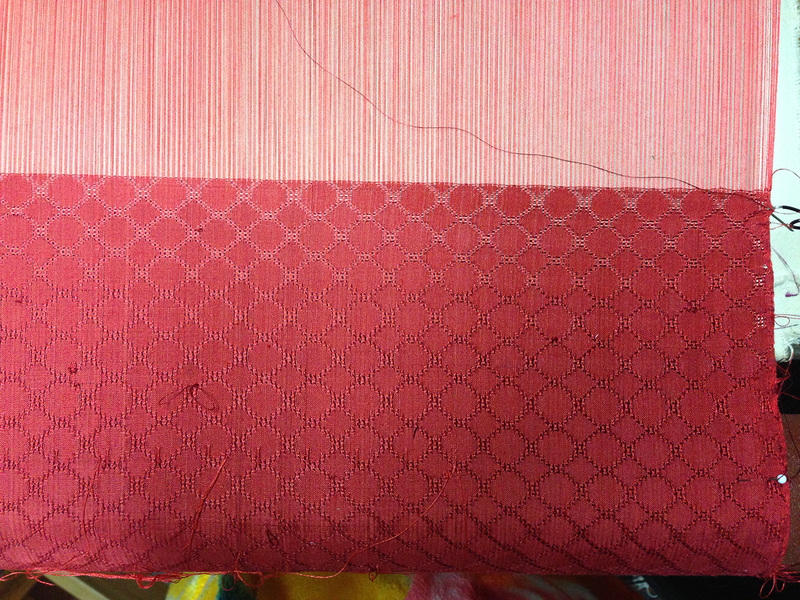 fine threads fabric sample – no broken threads! This is about four inches with no broken threads (the last broken thread is marked by the white pin on the right). My previous record was about 3/4 inch, so this is a HUGE improvement! The only problem is that now I am breaking threads right and left – that is, on the right and left selvages. I don’t think there is any good way to fix this since I beamed on at 90 epi and have resleyed to 75 epi, meaning the warp is narrow on the beam and wide in the reed, a sure recipe for broken selvage threads. I’m just living with it for now – since this is a sample warp, I just tie knots (or pull out the thread) and keep going. The photo doesn’t really do them justice – the color is deeper and richer in real life. 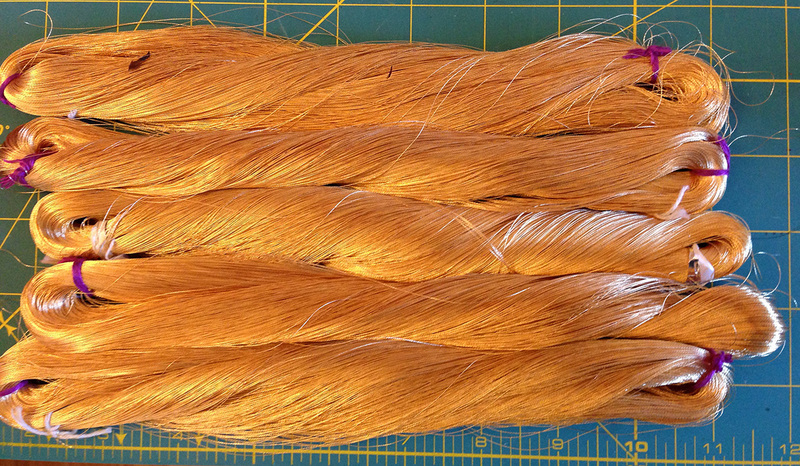 I have about 600 grams (20 ounces) of the yarn, so might have enough to do the phoenix. After three days of intense frustration, it was nice to get out of the house. Fortunately, nobody got my goat (especially good since I don’t own one! ), nor did I wind up with anyone else’s goat. Good time for a stroll. Plans for the next few days? Well, first, I have nine pounds of wonderful Gravenstein apples just begging to be made into applesauce. Gravensteins are one of the earliest apple varieties, and are my hands-down favorite. (The only ones that compete are the Wicksons, tiny little apples the size of crabapples, which are delightfully crisp, and taste almost like sugar cane.) Gravensteins are tart and sweet, with wonderful flavor, and they make fantastic applesauce. I cook them until soft, with a bit of butter and a very tiny bit of water to keep them from burning, then put them through a food mill. The resulting applesauce is to die for – and bears no resemblance whatsoever to the watery, bland stuff they sell in supermarkets. If you haven’t made your own applesauce at least once, from full-flavored heirloom varieties, you have no idea what you’re missing. It’s heavenly. And there’s more to tell on the book front, too, but I think this blog post is long enough already, so I’ll save it for later. Suffice it to say that I think I’ve found myself an interesting advisor, and am eager to see how things proceed over the next month or two. “Got my goat” = annoyed you in some way. “Someone got your goat?” when you’re feeling (mildly) angry. Not sure where it originated, though!